Engaging primary school children in the world of programming and computing is the aim of ComputerXplorers sessions using Kodu. Using XBox controllers as the means of programming their video game increases motivation levels and allows for rapid game iteration. 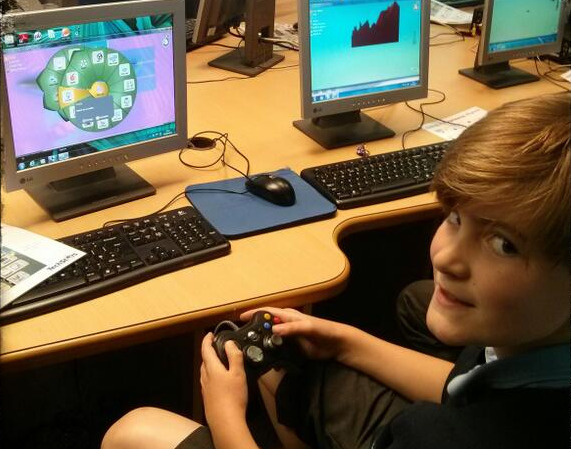 Students will use Kodu, a graphical programming environment to design and build games. They will then create a range of terrains, worlds and characters, controlling the characters' movement, sound and vision using an intuitive, icon-based programming language. It's the perfect way of building programming into the Computing Curriculum for Primary School children from the age of 8+. Teaching Primary School children about debugging, algorithms and parameters - with fun thrown in! The main goal of ComputerXplorers Kodu sessions is to get students motivated about computer programming in a fun, easy to use environment. The children will program on PCs using Xbox game controllers which allow for rapid design iteration and is a highly engaging medium for children. They will design, program and present their own unique video game controlling the characters’ movement, sound and vision while learning about debugging, algorithms and parameters. If you have been thinking about entering this year’s Kodu Kup, but feel perhaps you can do with some help to get started why not get some training from the team at ComputerXplorers, this year’s official training partner for Kodu Kup UK? For more information take a look here. ComputerXplorers are also Microsoft Partners in Learning. Contact us now to find out how we can work with you and your school. Created by Microsoft, Kodu is an icon based graphical programming language designed specifically for students allowing them to create personalised and unique video games. Programmes are composed of pages, which are broken down into rules, which are further divided into conditions and actions. The Kodu language is designed specifically for game development. Better understand the steps involved in creating a computer programme. Improve problem-solving skills, and foster problem-solving practices. Follow online and offline directions more fluidly. Implicitly practice maths through branching and scoring. Develop more positive attitudes towards computer programming. Create increasingly complex games thus showing a deeper understanding for complex coding sequences. Show evidence of perspective taking and empathy in game play. Collaboratively work to create innovative solutions.